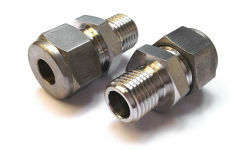 We keep stock of a wide range of compression fittings in various thread sizes, materials and bore sizes. Our fittings are manufactured to the same high quality designs we’ve been using for the last decade and are comprised of a body, nut and olive. Almost all of our fittings use 1-part olives for simplicity and ease of installation. For non-standard sizes we are able to bore out and adapt existing fittings to suit our customers needs. Available in brass and 303/316 stainless steel. BSP parallel and taper threads. Bore sizes from 0.5mm to 1/2″NB. Metric and imperial bore sizes. Along with fittings we can offer olives separately. Olives are available in PTFE, Stainless steel, Brass or Copper. PTFE and copper olives are useful in situations where the fitting/olive needs to be easily removed from the sheath or where variable compression is required. These olives are single-piece and designed to work with our fittings. On request we can offer alternative olives ready-fitted in our compression fittings if required.